According to scores of news articles, millions of Americans aren’t getting enough sleep, and sleep difficulties and disorders are to blame in most cases. The National Sleep Foundation stresses the importance of the bedroom environment for promoting good sleep. The ideal sleeping space should be dark, cool, uncluttered, and free of electronic devices, which interfere with sleep hormones. Their website states, “Your bedroom is your sanctuary from the stresses of the day. 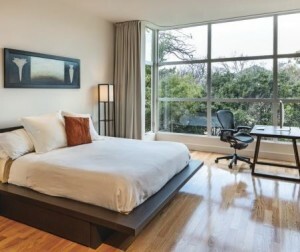 Use your senses to create the best environment for sleep.” At Curtain-Tracks.com we can’t help you put away piles of laundry, or keep you from playing Candy Crush in your bed, but we can help you create a bedroom that is warm, inviting, and relaxing. Our curtain tracks for bedroom curtains can be an integral part of your sleep oasis. You can, of course, hang curtains just on the windows of your bedroom, but curtain tracks for bedroom curtains allow you to hang curtains anywhere you want. Even if you only have one or two small windows, you can splice multiple tracks together to cover the whole wall, giving the illusion of more windows. You can also use curtains to cover a closet that doesn’t have a door, or to cover a storage area if you are cramped for space. All these options will add texture, warmth, and softness to the room while reducing the visible clutter, and hopefully, increasing restful sleep. Both ceiling and wall-mounted curtain tracks work well in bedrooms, and which one you pick is largely up to personal preference. Ceiling tracks will give an elegant floor-to-ceiling look, but wall-mounted tracks give a traditional look and allow you to install a valance, if you like the look. A popular approach to curtain tracks for bedroom curtains is to install two parallel tracks. This can be done with ceiling and wall-mounted tracks (with the right drapery hardware), and allows you to hang a sheer from one track and a decorative panel, or Eclipse light-blocking panel, from the other. This gives you control of the look of the room and the amount of light, both of which can be changed by simply opening or closing a couple of curtain panels. How has using curtain tracks in your bedroom affected your sleep? We’d love to hear about it at info@curtain-tracks.com.